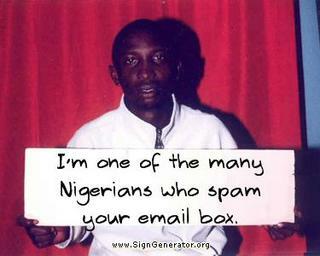 I Kill Spammers: The Nigerian ScamerAtor™! In India they have started sending such scams via sms and our lame telecom companies are not doing anything about it. worst telecom is Vodafone. It is a good idea i think. Are we authorized translate it (in french) to propose it after on forums ? I'm fascinated that they would contact you to request you to stop. Chutzpah? It's like a house-breaker doing a leaflet drop to ask people to turn off alarm systems. Maybe I'll ask the next 419er to send me a photo of himself holding a card reading "We do not pose for photos". > Are we authorized translate it (in french) to propose it after on forums ? Absolutely. And please let me know how to download a copy so I can also link to it here. Also to the Anonymous commenter: I will attempt to contact Vodafone and ask why they are dragging their feet regarding such a serious international criminal act. Thank you for the tips. I've been reporting these things for almost 2 years now. I noticed Hotmail/Live is a whole lot better than earlier, and I want my reports done in 10 min too! I'm going to be more specific about where to find the address. One really frustrating thing is the Nigerian and Benin ISPs that won't even accept the reports. I see a lot of other ISPs with abuse addresses, and very few that say they correct the problem. But, when you write to Multilinks in Nigeria, Benin Telecom and a few others, all you get is bounce backs that they don't receive the report. And, similar or same IPs keep getting used. Can anyone tell these ISPs that their infrastructure is being abused? > Can anyone tell these ISPs that their infrastructure is being abused? Try sending a more basic email to them that only asks: how do I report continued criminal abuse of your services? Their spam filters are probably pretty heavily abused also. When and if they reply, save a text copy of the entire spam message on a site like pastebin.com and send them a link to it, and make sure you tell them that they need a proper abuse contact address which will not have spam filters on it so that they can properly act on this continued abuse. But good luck with that, generally speaking. Benin is a pretty corrupt country, as is Nigeria. That's why this criminal activity is so rampant. Thank you for all your advice in fighting these 419 criminals. I've made it one of my hobbies to nail these guys in an attempt to make their lives of scam more difficult. This is one of the best places I've found to ask questions and get friendly helpful answers. My question today has been bugging me for many months now. Thank you for any info on it. How and where do we report the telephone numbers the crooks place in their messages to call them to be scammed? Usually, it is a Benin or Nigerian number, but I've seen what looks like UK or US numbers too (that probably connect to Africa). Cancelling the email addresses does not solve the whole scam and spam problem if victims call these numbers and send their IDs and money. Where can we email or enter info in to get these numbers cancelled quickly? Thank you so much for your advice and expertise on this. I appreciate it. Usually, I ask the providers if they know where and can report the numbers when I report the email addresses. But, I doubt they are getting these cancelled either. Again, thanks. You raise an interesting, and unfortunately (so far) frustrating question. If any of my readers ever find a form which will perform this function I'd be much obliged to know about it. So far, only the US has such a service. Based on several reports I've read about scammers who got convicted for this activity, they purchase cheap "pay as you go" phones which they know they won't use for long, and they switch numbers often, so even reporting the phone numbers might not be that helpful. I appreciate the question and I wish I had a more solid answer for you.